The Rule of Saint Basil refers to the monastic regulations formulated by Saint Basil the Great (ca. 330 - January 1, 379 C.E. ), which became the basis of the monasticism in the Eastern Orthodox Churches, as well as some Greek Catholic communities. Saint Basil of Caesarea codified the precepts for these eastern monasteries in his Ascetic Rule, or Ascetica, which is still used today in the Eastern Orthodox Church. The development of rules for Christian monks was an effort to bring greater discipline, order and structure to the emerging cenobitic communities that were slowly replacing the eremitic tradition of the Desert Fathers. Saint Basil (ca. 330 - January 1, 379 C.E.) founded a monastery on the banks of the Iris River in Cappadocia around 356 C.E. Before forming this community, he visited Egypt, Coelesyria, Mesopotamia, and Palestine in order to see for himself the manner of life led by the monks in these countries. He noted that in many places, such as Syria, the monastic life tended to become very eremitical and was very rigorous in the matter of bodily austerities. When Basil formed his monastery in the neighborhood of Neocaesarea in Pontus, he deliberately set himself against these tendencies. He declared that the cenobitical life is superior to the eremitical; that fasting and austerities should not interfere with prayer or work; that work should form an integral part of the monastic life, not merely as an occupation, but for its own sake and in order to do good to others; and therefore that monasteries should be near towns. All this was a new departure in monasticism. As a result, Salminius Hermias Sozomen said that in Cappadocia and the neighboring provinces there were no hermits - only cenobites. However, the eastern hankering after the eremitical life long survived, and it was only by dint of legislation, both ecclesiastical (Council of Chalcedon) and civil (Justinian Code), that the Basilian cenobitic form of monasticism came to prevail throughout the Greek-speaking lands, though the eremitical forms have always maintained themselves. 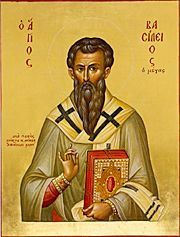 The monasteries of Cappadocia were the first to accept the Rule of Saint Basil; it afterwards spread gradually to all the monasteries of the East. Those of Armenia, Chaldea, and of the Syrian countries in general preferred instead of the Rule of Saint Basil those observances which were known among them as the Rule of St. Anthony. Neither the ecclesiastical nor the imperial authority was exerted to make conformity to the Basilian Rule universal. It is therefore impossible to tell the epoch at which it acquired the supremacy in the religious communities of the Greek world; but the date is probably an early one. The development of monasticism was, in short, the cause of its diffusion. Protected by the emperors and patriarchs the monasteries increased rapidly in number. The position of the monks in the empire was one of great power, and their wealth helped to increase their influence. Thus their development ran a course parallel to that of their Western brethren. The monks, as a rule, followed the theological vicissitudes of the emperors and patriarchs, and they showed no notable independence except during the iconoclastic persecution; the stand they took in this aroused the anger of the imperial controversialists. The Faith had its martyrs among them; many of them were condemned to exile, and some took advantage of this condemnation to reorganize their religious life in Italy. Of all the monasteries of this period the most celebrated was that of Saint John the Baptist of Studium, founded at Constantinople in the fifth century. It acquired its fame in the time of the iconoclastic persecution while it was under the government of the saintly Hegumenos (abbot) Theodore, called the Studite. Nowhere did the emperors meet with more courageous resistance. At the same time the monastery was an active center of intellectual and artistic life and a model which exercised considerable influence on monastic observances in the East. Theodore attributed the observances followed by his monks to his uncle, the saintly Abbot Plato, who first introduced them in his monastery of Saccudium. The other monasteries, one after another adopted them, and they are still followed by the monks of Mount Athos. The monastery of Mount Athos was founded towards the close of the 10th century through the aid of the Emperor Basil the Macedonian and became the largest and most celebrated of all the monasteries of the Orient; it is in reality a monastic province. The monastery of Mount Olympus in Bithynia should also be mentioned, although it was never as important as the other. The monastery of Saint Catherine on Mount Sinai, which goes back to the early days of monasticism, had a great fame and is still occupied by monks. Reference to Oriental monks must here be limited to those who have left a mark upon ecclesiastical literature: Leontius of Byzantium (d. 543), author of a treatise against the Nestorians and Eutychians; Saint Sophronius, Patriarch of Jerusalem, one of the most vigorous adversaries of the Monothelite heresy (Patrologiae Graecae, LXXXVII, 3147-4014); Saint Maximus the Confessor, Abbot of Chrysopolis (d. 662), the most brilliant representative of Byzantine monasticism in the seventh century; in his writings and letters St. Maximus steadily combated the partisans of the erroneous doctrines of Monothelitism (ibid., XC and XCI); Saint John Damascene, who may perhaps be included among the Basilians; St Theodore the Studite (d. 829), the defender of the veneration of sacred images; his works include theological, ascetic, hagiographical, liturgical, and historical writings (Patrologiae Graecae, XCIX). The Byzantine monasteries furnish a long line of historians who were also monks: John Malalas, whose " hronographia" (Patrologiae Graecae, XCVII, 9-190) served as a model for Eastern chroniclers; Georgius Syncellus, who wrote a "Selected Chronographia"; his friend and disciple Theophanes (d. 817), Abbot of the "Great Field" near Cyzicus, the author of another "Chronographia" (Patrologiae Graecae, CVIII); the Patriarch Nicephorus, who wrote (815-829) an historical "Breviarium" (a Byzantine history), and an "Abridged Chronographia" (Patrologiae Graecae, c. 879-991); George the Monk, whose Chronicle stops at 842 C.E. (Patrologiae Graecae, CX). There were, besides, a large number of monks, hagiographers, hymnologists, and poets who had a large share in the development of the Greek Liturgy. Among the authors of hymns may be mentioned: Saint Maximus the Confessor; Saint Theodore the Studite; Saint Romanus the Melodist; Saint Andrew of Crete; Saint John Damascene; Cosmas of Jerusalem, and Saint Joseph the Hymnographer. Fine penmanship and the copying of manuscripts were held in honor among the Basilians. Among the monasteries which excelled in the art of copying were the Studium, Mount Athos, the monastery of the Isle of Patmos and that of Rossano in Sicily; the tradition was continued later by the monastery of Grottaferrata near Rome. These monasteries, and others as well, were studios of religious art where the monks toiled to produce miniatures in the manuscripts, paintings, and goldsmith work. The triumph of orthodoxy over the iconoclastic heresy infused an extraordinary enthusiasm into this branch of their labors. From the beginning the Oriental Churches often took their patriarchs and bishops from the monasteries. Later, when the secular clergy was recruited largely from among married men, this custom became almost universal, for, as the episcopal office could not be conferred upon men who were married, it developed, in a way, into a privilege of the religious who had taken the vow of celibacy. Owing to this the monks formed a class apart, corresponding to the upper clergy of the Western Churches; this gave and still gives a preponderating influence to the monasteries themselves. In some of them theological instruction is given both to clerics and to laymen. As long as the spirit of proselytism existed in the East the monasteries furnished the Church with all its missionaries. The names of two have been inscribed by Rome in its calendar of annual feasts, namely, Saint Cyril and Saint Methodius, the Apostles of the Slavs. The Byzantine schism did not change sensibly the position of the Basilian monks and monasteries. Their sufferings arose through the Muslim conquest. To a large number of them this conquest brought complete ruin, especially to those monasteries in what is now Turkey in Asia and the region around Constantinople. In the East the convents for women adopted the Rule of Saint Basil and had constitutions copied from those of the Basilian monks. Greek monachism underwent no development or change for four centuries, except the vicissitudes inevitable in all things human, which in monasticism assumed the form of alternations of relaxation and revival. The second half of the 8th century seems to have been a time of very general decadence; but about the year 800 C.E. Theodore the Studite became abbot of the monastery of the Studium in Constantinople. He set himself to reform his monastery and restore Saint Basil's spirit in its primitive vigor. To effect this, he saw that there was need of a more practical code of laws to regulate the details of the daily life, as a supplement to Saint Basil's Rules. (As he gave it, the Rule could not suffice for anyone who wished to organize a monastery, for it takes this work as an accomplished fact.) He, therefore, drew up constitutions, afterwards codified, which became the norm of the life at the Studium monastery, which gradually spread to the monasteries of the rest of the Greek empire. Thus, to this day, the Rules of Basil and the Constitutions of Theodore the Studite, along with the canons of the Councils, constitute the chief part of Greek and Russian monastic law. The Rule of Basil is divided into two parts: the "Greater Monastic Rules" (Regulae fusius tractatae, Migne, P.G., XXXI, 889-1052), and the "Lesser Rules" (Regulae brevius tractatae, Ibid., 1051-1306). Rufinus who translated them into Latin united the two into a single Rule under the name of Regulae sancti Basilii episcopi Cappadociae ad monachos; this Rule was followed by some western monasteries. In his Rule, Basil follows a catechetical method; the disciple asks a question to which the master replies. He limits himself to laying down indisputable principles that are to guide the superiors and monks in their conduct. He sends his monks to the Sacred Scriptures; in his eyes the Bible is the basis of all monastic legislation, the true Rule. The questions refer generally to the virtues that the monks should practice and the vices they should avoid. The greater number of the replies contain a verse (or several verses) of the Bible accompanied by a comment that defines the meaning. The most striking qualities of the Basilian Rule are its prudence and its wisdom. It leaves to the superiors the care of settling the many details of local, individual, and daily life; it does not determine the material exercise of the observance or the administrative regulations of the monastery. Poverty, obedience, renunciation, and self-abnegation are the virtues which Basil makes the foundation of the monastic life. The life of the Cappadocian monks could not be reconstructed from his references to the nature and number of the meals and to the garb of the inmates. The superiors had for guide a tradition accepted by all the monks. This tradition was enriched as time went on by the decisions of councils, by the ordinances of the Emperors of Constantinople, and by the regulations of a number of revered abbots. Thus there arose a body of law by which the monasteries were regulated. Some of these laws were accepted by all, others were observed only by the houses of some country, while there were regulations which applied only to certain communities. In this regard Oriental monasticism bears much resemblance to that of the West; a great variety of observances is noticeable. The existence of the Rule of Saint Basil formed a principle of unity. Basilian monks follow the Rule of Saint Basil; however, the monks of the Orthodox Churches do not call themselves Basilians, whereas the Greek Catholics do. After the Great Schism, most Basilian monasteries became a part of the Eastern Orthodox Church, however some Basilian monasteries in Italy remained in the Western Church. For example, the monastery of Rossano, founded by Saint Nilus the Younger, remained for a long time faithful to the best literary traditions of Constantinople. The monasteries of San Salvatore of Messina and San Salvatore of Otranto may be mentioned; the monastery of Grottaferrata was also celebrated. The emigration of the Greeks to the West after the fall of Constantinople and the union with Rome, concluded at the Council of Florence, gave a certain prestige to these communities. Cardinal Bessarion, who was Abbot of Grottaferrata, sought to stimulate the intellectual life of the Basilians by means of the literary treasures that their libraries contained. A number of Roman Catholic communities continued to exist in the East. The Holy See caused them to be united into congregations, namely: the Congregation of Saint Savior founded in 1715, which includes eight monasteries and 21 hospices with about 250 monks; the Congregation of Aleppo, with four monasteries and two hospices; the Congregation of the Baladites (Valadites) with four monasteries and three hospices. These last two congregations have their houses in the district of Mount Lebanon. Saint Josaphat Kuntsevych and Father Rutski, who labored to bring back the Ruthenian Churches into Catholic unity, reformed the Ruthenian Basilians forming the Order of Saint Basil the Great. In the sixteenth century, the Italian monasteries of the Basilian Order were in the last stages of decay. Urged by Cardinal Sirlet, Pope Gregory XIII ordained (1573) their union in a congregation under the control of a superior general. Use was made of the opportunity to separate the revenues of the abbeys from those of the monasteries. The houses of the Italian Basilians were divided into the three provinces of Sicily, Calabria, and Rome. Although the monks remained faithful in principle to the Greek Liturgy they showed an inclination towards the use of the Latin Liturgy; some monasteries have adopted the latter altogether. In Spain, there was a Basilian congregation that had no traditional connection with Oriental Basilians; the members followed the Latin Liturgy. Father Bernardo de la Cruz and the hermits of Santa Maria de Oviedo in the Diocese of Jaen formed the nucleus of the congregation. Pope Pius VI added them to the followers of Saint Basil and they were affiliated with the monastery of Grottaferrata (1561). The monasteries of Turdon and of Valle de Guillos, founded by Father Mateo de la Fuente, were for a time united with this congregation, but they withdrew later in order to form a separate congregation (1603) which increased very little, having only four monasteries and a hospice at Seville. The other Basilians, who followed a less rigorous observance, showed more growth; their monasteries were formed into the two provinces of Castile and Andalusia. They were governed by a vicar general and were under the control, at least nominally, of a superior general of the order. Each of their provinces had its college or scholasticate at Salamanca and Seville. They did not abstain from wine. Like their brethren in Italy they wore a cowl similar to that of the Benedictines, leading to recriminations and processes, but they were authorized by Rome to continue the use of this attire. Several writers are to be found among them, as: Alfonso Clavel, the historiographer of the order; Diego Niceno, who has left sermons and ascetic writings; Luis de los Angelos, who issued a work on "Instructions for Novices" (Seville, 1615), and also translated into Spanish Cardinal Bessarion's exposition of the Rule of Saint Basil; Felipe de la Cruz, who wrote a treatise on money loaned at interest that was published at Madrid in 1637, and one on tithes, published at Madrid in 1634. The Spanish Basilians were suppressed with the other orders in 1833 and have not been re-established. The Congregation of Saint Basil was formed in Annonay, France in (1822) under the Rule of Saint Basil. The Basilian Fathers were established as a religious congregation as result of the closing of seminaries during the French Revolution. A secret school in the mountains of central France, which still exists today. Currently the Basilian Fathers have a branch at Toronto, Canada, which is a community of priests and students for the priesthood. In their statement of mission they say: "Ours is an active, apostolic community of simple vows, which seeks the glory of God in every form of priestly activity compatible with the common life." ↑ Further details may be found in "Prescriptio constitutionis monasterii Studii" (Migne, P.G., XCIX, 1703-1720), and the monastery's "Canones de confessione et pro peccatis satisfactione" (Ibid., 1721-1730). ↑ Congregation of St. Basil. www.basilian.org. Retrieved January 28, 2008. Jacques Paul Migne (25 October 1800 - 24 October 1875) Patrologiae Graecae  index. All links retrieved May 13, 2016. Congregation of St. Basil. www.basilian.org. History of "Basil, Rule of Saint"
This page was last modified on 13 May 2016, at 21:11.